Free, New Viovio iPad App makes it Easy to Create and Order High Quality Photo Books from Anywhere…Plus a Special Offer for You! Viovio, a leading online photo book company and PhotographyTalk vendor partner, is being true to its name with its new and free photo book creator iPad app. “Vio” is Latin for “go,” and now you can order Viovio’s high quality photo books wherever you go by simply dragging and dropping your photos from your iPad, Facebook, Instagram, Picasa or Flickr into any of Viovio’s photo book templates. Better yet, as a PhotographyTalk member or visitor, Viovio has a special offer to introduce you to its new iPad app…you’ll receive 10% off iPad-created books with the vendor code: PTiPAD10. This is a limited-time offer, so download the app from the Apple App Store today and start saving. It’s a great offer just in time for holiday gift giving. You’ll find hundreds of templates in many themes, including babies, holidays, love, sports, travel and weddings. Choose from 36 different sizes, from landscape to square to portrait; 6 different bindings, including hardcover, softcover, perfect bound and wire-o matte; and 3 paper stocks: gloss silk and satin. Once you download your photos via the free iPad app, you can then change background colors, add text, enhance your photos with filters and share the completed book via Facebook or other social media. Viovio printed photo books start as low as $10.99 for a 20-page softcover. Just imagine, you’re on vacation and you want to share your photos in a special way with grandparents or friends who are not Web-savvy or big participants of social media. After a long day capturing photos of all the amazing people you’ve seen and places you’ve visited, you can use the Viovio iPad app to create and order a one-of-a-kind photo book that could arrive before you return home. Your family members or friends will receive a special book of pictures of your travels, which will also serve as a keepsake of memories. The new Viovio iPad app is also a time saver for professional photographers. When on a long-term assignment, especially far from home and your studio, you’re able to create photo books for clients the same day as a shoot. Plus, Viovio has a reputation for a quick turnaround of orders, so photo books may ship and be received, and circulating before you return home. Drag and drop photos into any of the photo book templates to create an instant portfolio of your latest images. Editors are more likely to be attracted to your beautifully designed and printed portfolio than another Website they must visit to scroll through a plain-looking page of photos. 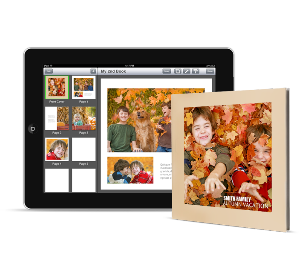 When you’re reviewing images with wedding, portrait or senior high school clients, you can create one or more photo books together, via your iPad. Your clients know exactly what they will be receiving without the need for time-wasting edits or changes in the future; and their photo books will be ordered and speeding to them as soon as they approve the design and photo selection. The free Viovio iPad is compatible with iOS 5.0 or newer versions. It is a native iOS app that makes full use of the graphics capabilities of the iPad 2 and The New iPad. Viovio offers much more than photo books. It has a complete selection of photo cards, calendars, portfolios, scrapbooks, self-published books, instructional manuals and so much more. You can also upload a complete PDF file of photos and text that will print with just as much high quality as any of the drag-and-drop templates. The app is fully integrated into the main Viovio site, so you’re also able to add a commission and sell your books in Viovio’s online marketplace. Remember to take advantage of Viovio’s special offer to all PhotographyTalk members and visitors…10% off your order of Viovio photos books created with the new and free Viovio iPad app. Please use vendor code: PTiPAD10.